"I'm not in the habit of watching ST-Voyager," he says, "so I'm unfamiliar with this reference. This *omega molecule* which you extrapolate into hyperspace sounds intriguing, but ... what is it?" Omega is infinitely complex -- yet harmonious. To the Borg it represents perfection. I wish to understand that perfection. There were subspace ruptures extending out several light years. Making it impossible to create a stable warp field. A chain reaction involving only a handful of molecules would destroy subspace as we know it. The Borg designed it to contain and stabilize Omega. Federation cosmologists had a theory that the molecule once existed in nature for an infinitesimal second. Some claimed Omega was the primal source of energy that began our universe. A creation myth like any other. What is it that the Borg say? That Omega is perfect? 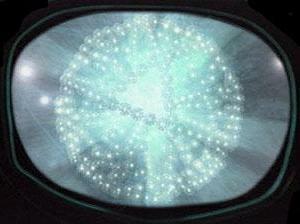 The Borg designation for Omega. The Borg were instructed to assimilate it at all costs. The molecules exist in a flawless state. Infinite parts functioning as one. I am no longer Borg. But I still need to understand that perfection. Without it my existence will never be complete. Commander, you are a spiritual man? I'd pursue it with all my heart. Close-up of 7 looking into the chamber viewfinder. This simulation contains many religious components. I was studying them to help me understand what I saw. Chances are it was simply a chaotic anomaly. For 3.2 seconds I saw perfection. When Omega stabilized, I felt a curious sensation. It seemed to be watching me. with many mythologies to explain such moments of clarity. I've always dismissed them as trivial. I'd say you had your first spiritual experience.